South Africa may not be the first place you think of when planning a family holiday, but it should be. It's the perfect playground for adventurous families, with only two possible downsides for those traveling from North America or Europe. Getting to South Africa from either of these locations requires a long-haul flight, which can be both expensive and challenging with small children. When you get there, distances on the ground can also be long - so be prepared for a few lengthy car journeys. However, with so many family-friendly activities on offer, the benefits of visiting South Africa hugely outweigh these minor drawbacks. South Africa has an amazing climate, fabulous beaches, friendly people, great food - and of course, a bevy of iconic animals. Where else in the world can your child potentially ride an elephant, feed an ostrich, pet a lion cub or swim with penguins, all on the same vacation? Cultural opportunities abound, too, whether you decide to teach your kids about life in the townships, or take them on mountain hikes to marvel at ancient rock art left by the San Bushmen. And that's just the start. There are a huge number of things to do, from simple picnics on the beach to once-in-a-lifetime safari experiences. Don't be over-ambitious in your planning. Remember that South Africa is huge and that if you try and cover the whole country you're unlikely to do any of it justice (unless of course, you have unlimited time on your hands). You'll do better if you concentrate on one or two areas so that the amount of traveling is limited. For instance, a week in the area around Cape Town and a week in Kwazulu-Natal would allow you a perfect mix for a family holiday with city, beach and bush, flying between Cape Town and Durban partway through. Hiring a car is easy in South Africa and gives you the freedom you need with a family, as long as you're happy driving on the left and can cope with a stick shift. If you need child seats, make sure to order them when you hire the car. If you're planning to take your hire car on a self-drive safari, a high clearance vehicle is essential (and 4WD is a bonus). Wherever you're headed, consider fuel consumption - although gas is relatively cheap, the distances are long and costs quickly add up in a thirsty vehicle. Roads are generally good in South Africa, although for safety's sake it's best to limit your time on the road to daylight hours. Many hotels are extremely welcoming; however, not all South African hotels accept children under the age of 10. Therefore, it's important that you research your accommodation choices carefully and never rely on being able to simply turn up with small children. B&Bs and self-catering accommodation are usually quite flexible, while another possibility is to look at hiring a private villa or apartment. The generous rand/dollar exchange rate helps to make this an affordable option. If you'd like help when choosing your accommodation, there are some excellent tour operators (including Cedarberg Travel and Expert Africa) who specialize in family-friendly holidays and have a variety of different itineraries to choose from. Alternatively, many operators can help create your own personalized tour. If you're wondering whether or not safaris and children go together, the answer is usually absolutely and unequivocally yes. After all, they are the next generation of planetary caretakers and perhaps get the most enjoyment out of the African bush. 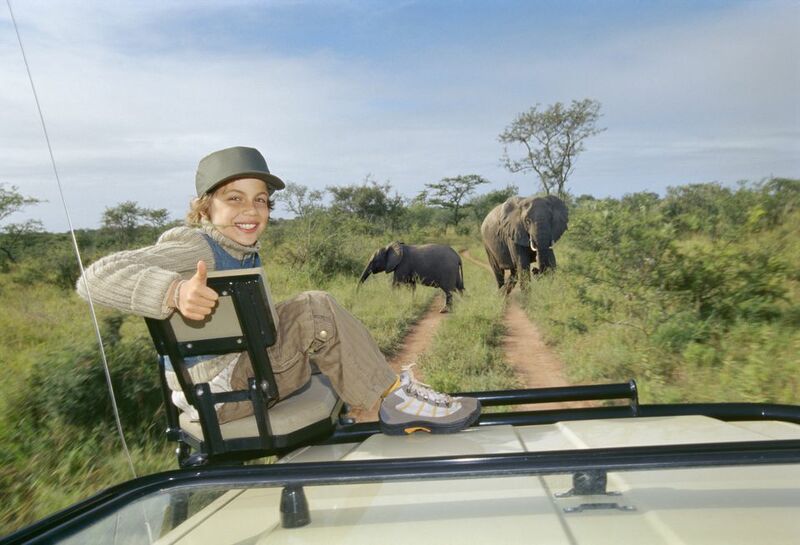 However, young children may not have the patience necessary to sit quietly in a game vehicle for hours on end, and as such, many places only recommend safaris for children aged seven and older. However, you know your children best, and the correct age to take your kids on safari is a judgment call you must make for yourself. Make sure to choose a safari company that can facilitate your decision. Quite a few luxury lodges are adults-only; while others go out of their way to welcome children with special children's activity programs. In some cases, you can even book exclusive use of a game vehicle, or opt to stay in a separate accommodation complex so that you and your kids can enjoy yourselves without worrying about other guests. South Africa is one of only a few countries in Africa where it is possible to embark on a self-drive safari in your own vehicle, staying at National Park rest camps at a very affordable rate. However, if you're new to game-viewing, it's well worth the extra expense to go out with a ranger who can spot the most elusive animals and teach your family about the bush environment. If you're worried about cost, consider staying outside the reserve and booking day game drives instead - or read our helpful tips on planning an affordable African safari. Contrary to popular belief, South Africa is actually pretty safe. Much of the crime for which the country is infamous is confined to poorer inner city areas, and staying safe in the game reserves and tourist districts of major cities is usually a matter of common sense. Tap water is generally drinkable, and supermarkets and restaurants cater to a wide range of dietary requirements including plenty of child-friendly choices. The weather can be extreme in summer, so bring hats and plenty of sun-screen. There are a variety of potentially dangerous snakes and insects in the African bush, so it's important that your kids are aware of where they put their hands and feet while on safari. Make sure children have shoes on when running around outside, and pack a basic first aid kit to deal with cuts, scrapes, bites, and stings. Before you travel, check the vaccine requirements and ensure that your family's shots are up-to-date. If you don't want to put your children on anti-malaria medication, opt to stay in a malaria-free area. The Waterberg, Western Cape, and Eastern Cape areas are all malaria-free. Children sometimes need a little help to keep them focused and entertained. Encouraging them to keep a travel diary is a great idea, especially if you choose a paper one rather than an electronic one, write in it daily and collect things to put in it from pressed grasses to sugar packets, tickets, and postcards. In this way, it becomes a treasured souvenir that will last for the rest of their lives. Alternatively (or additionally), buy a cheap camera and let your children take their own photos. As of 1 June 2015, the South African Department of Home Affairs issued new rules for children traveling to and from South Africa, requiring that parents produce an unabridged birth certificate for each child as well as their passport and visa. Bear in mind that abridged birth certificates and uncertified photocopies will not be accepted. In certain cases (e.g. if your child is traveling with only one parent or with adoptive parents), other documentation may be required.